The Queensland Conservatorium Saxophone Orchestra showcases an exciting array of newly commissioned multi-stylistic works composed by past and present students of Griffith University. Composers including Matthew Klotz, Matilda Grieve, Jack Lundie-Jenkins and Carlin Hara-Crockford bring to life Australian themed works, drawing on inspiration from landscapes, stories and memories, showcasing the talents of the ensemble. ‘Australian Made’ boasts a program of rich harmonies, contrasting textures and extended techniques. The versatility of the saxophone supports the programmatic nature of these works, celebrating all things Australian ranging from idyllic coastlines to the arid outback, ensuring something for all musical tastes. Since inception the Queensland Conservatorium Saxophone Orchestra (QCSO) has strengthened exponentially, now enjoying its 11th year of evolution. Directed by Queensland Conservatorium saxophone staff member and alum, Pierce Hurne. Keen to enthuse and educate younger students, the ensemble tours throughout the year to perform works arranged and composed by themselves, as well as tutoring and sharing their passion for the saxophone. QCSO continually approaches Australian composers of all influences culminating in an annual ‘Australian Made’ recording available on CD Baby: http://www.cdbaby.com/cd/queenslandconservatorium. 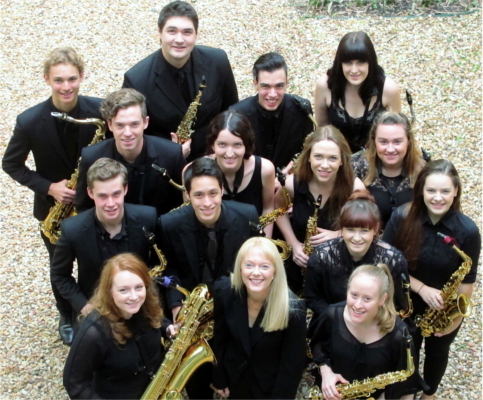 In July of 2015, they took to touring to Manchester to perform with the Royal Northern College of Music students, Paris in the Selmer Showroom, and Strasbourg to perform in the XVII World Saxophone Congress in their own featured recital, in addition to performing with the Australian Saxophone Orchestra. Other notable performance includes the 2012 World Saxophone Congress XVI in Scotland, Guildhall School of Music, London and the International Society of Music Education Conference in Thessaloniki, Greece.